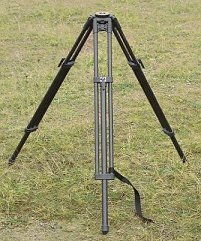 Through design and use of high quality materials the P900 tripod offers durability, stability, and ease of use. The composite, stainless steel and anodized aluminum components provide resistance to impact, corrosion and moisture allowing use in extreme environments, giving you confidence that it will work the next time you need it. The legs are a wide frame single extension design. This creates a rigid and stable platform by reducing the number of joints where unwanted movement can take place. Carbon-fiber reinforced leg tubing has increased stiffness and decreased vibration, all helping you obtain the best image results possible. Setups are quick and easy with three pre-set leg angle positions and a single quick lock lever handle for leg height adjustment. Standard 3/8"-16 threaded stud for equipment attachment.